About - Brian D'Andrea Custom Cabinetry Inc.
At Brian D’Andrea Custom Cabinetry, we strive to provide our customers with the finest quality cabinetry at competitive prices while we custom manufacture cabinetry to your exact specifications. At Brian’s, you deal directly with the manufacturer, allowing you to have control over your entire project, from start to finish. Whether it is picking a custom stain color, wood species, or design style, you are only limited by your imagination! Our business has been built on the philosophy of giving the customer what they want, not mass producing a product you have to settle for. Our philosophy is old fashioned; a satisfied customer is our ultimate goal. Brian D’Andrea, the owner, found his passion for woodworking at the young age of 13. He purchased his first set of woodworking tools at a flea market with his father. Working two hours every day before school, people started challenging him to build more complicated things. By the time he was 14 years old, he worked with a custom cabinet shop. He worked at the shop through high school where he began to highly developed his skills. After graduating from college at 21, Brian D’Andrea Custom Cabinetry was opened in 2003. There are currently eight employees with a combined experience level of over 90 years in the custom residential cabinetry field. 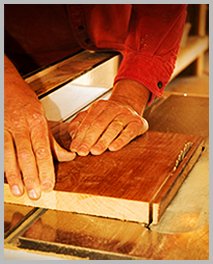 At Brian D’Andrea Custom Cabinetry, we take a very personal approach to all of our work. It is very important that each customer is treated with dignity and every project is done as if it were our own. We always present quality clear-cut solutions for each customer, while also keeping things as economical as possible. Interested in our work? Click here to provide us with detailed information on the services you are looking for. We will be more than happy to provide you with a personalized quote. Our creative designs, precision wood joinery and close attention to detail is what separates us from the rest. Click here to see how we can transform your home. At Brian D’Andrea’s Custom Cabinetry, we take pride in every project we do. Our wide variety of custom services allows us to cater to your individual taste.